Will the Paris Climate Agreement Save Us? In spite of political characters like Donald Trump, who still say publicly that they believe climate change and global warming is a hoax, world leaders within the United Nations have been concerned enough to gather collectively 11 times since the 1997 Kyoto Protocol to control carbon emissions was reached in Japan. As happens when government leaders representing a broad variety of nationalities and business concerns gather to deal with a common problem opinions vary. Thus while they agree that something must be done it has been extremely difficult for representatives from all nations to draft a plan that is fair to everybody. What they appear to agree on, however, is that global warming is real, it appears to be heavily affected by industrial carbon emissions, and the warming planet is causing extreme changes in the world’s weather. This in turn is already having a major impact on business profits, food production and the protection of property. Tragically after then U.S. Vice President Al Gore helped drive the participating representatives into accepting the Kyoto Protocol in 1997, Gore lost his campaign for the presidency the following year. Republican George W. Bush, who took the post was an outspoken global warming denier. Needless to say the United States, among the world’s largest producers of carbon emissions and the key component to making the Kyoto Protocol work, failed to ratify the agreement. While 197 nations signed the protocol, the U.S. was sadly one of only three that did not. In spite of continued efforts to make the Kyoto Protocol have an impact on the looming climate disaster, the world was forced to wait another eight years before the Bush Administration left office and new more sympathetic leadership came to power. It was a delay that has brought disastrous results. The effects of what weather and news commentators are now calling “climate change” has reached such extreme levels that many scientists worry that it may be too late to reverse the changes occurring everywhere. While the news appears to be purposefully avoiding this issue, it cannot cover up the violent storms, flooding, extreme heat, drought, forest fires and subsequent crop losses that are going on all around us. Ice caps and glaciers are in meltdown and sea levels are already rising to a point where some inhabited tropical islands have had to be evacuated. Seafront property, once a prized possession, is now in danger of destruction from tropical storms and high water levels. China has reportedly been battling extreme air pollution since Kyoto. This problem has been made worse because of new trade agreements that made it possible for polluting industries formerly located in the U.S. to move to China in search of cheap labor. The Paris agreement appears to be something that is acceptable to both the U.S. and China. President Obama and General Secretary Xi Jinping of China reached a mutual agreement to limit greenhouse gas emissions in 2014. The Paris Agreement, which calls for combined efforts to limit global warming to less than 2 degrees Celsius compared to pre-industrial levels, and a 1.5 degree Celsius goal by 2030, was signed by 174 countries in New York on April 22, 2016 (Earth Day). Some scientists say it may require zero carbon emissions to reach that latter goal. 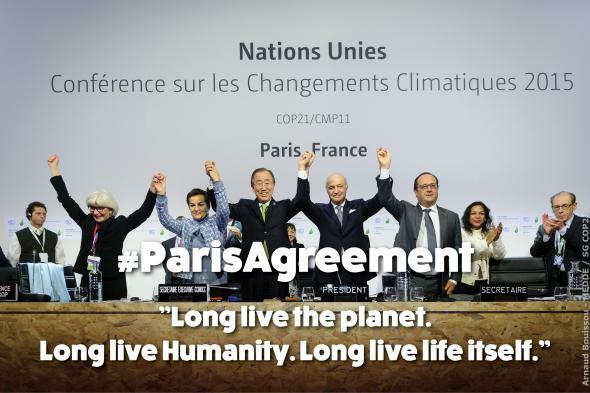 The Paris agreement now awaits ratification by all of the participating government bodies. It will take the ratification if at least 55 nations before the document goes into effect. As of July, 2016, 22 nations have ratified the agreement. The United States and China are not yet among them. This agreement is, in essence, an attack on the coal, gas and oil industries. This consequently involves big business. On cue, all of these interests are lobbying heavily in Washington against controls on carbon emissions. The decision on whether the U.S. ratifies this important world-wide agreement and begins the long hard shift into a green energy environment will depend upon voters and the people they choose for leadership in November. Democratic candidate Bernie Sanders did his part in pushing his parties platform far enough left of center this year that a Democratic controlled legislature may agree to ratification. If the election goes the other way, much of the hard work that went into the Kyoto and Paris agreements will have been for naught. Fortunately, private interests all over the world are not waiting for their governments to respond to this deadly problem. They are taking matters into their own hands and building alternative ways to generate electricity, heat our homes and operate our cars, aircraft and ships without using carbon fuels.